Exciting news alert: TInyRadars No. 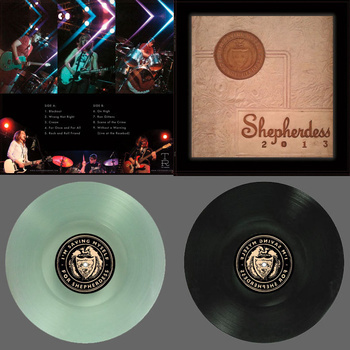 5 is now available for pre-order from the Shepherdess Bandcamp site. The first 100 copies are on coke-bottle clear green vinyl. How awesome is that? Its the most awesome. But no joke: they've only been on sale for less than a day and they are FLYING off the virtual shelf so if you want in on that you better do it quick because they are gonna sell out of them before the record release show even happens! Plus you can stream two tracks from the new album now too and if you buy the pre-order you get a download of those to put on your iPods/Pads/PHONES/MP3PLAYERZ/TransferToTape/Whateveryoucrazykidsdothesedays. "Blackout" is straight up one of our favorite jams.